3 For Woodshop program there are 2 size blanks based on height of student. 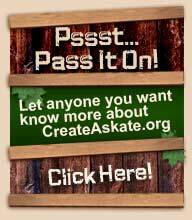 8 Guide school personnel to website www.Createaskate.org by supplying them with the address or email them by clicking on TELL A FRIEND banner available on several pages within website. 9 You can do School fundraising, recycle cans/paper etc, or come up with your own creative ways to raise money. Work for it. 10 The blank deck is considered a woodshop project and isn’t considered a true skateboard until it is rideable. Check with your school policy and transportation rules regarding items you can take on buses. Ex. The deck is no different than a violin as far as items that get transported. 11 Skateboard shops have all the tools and other items you would need to complete your skateboard deck. 12 This program is available to students (both male and female) that participate in woodshop or art classes. 13 You will learn and apply subject matter that incorporates Math, Science, Design, Vocabulary, Engineering and Manufacturing as well as the sense of accomplishment of creating something with your own two hands. 14 Download a petition form and get students, parents to sign stating you want the program in your school. Students can take to administrator at schools and Parents can take petitions to PTA meetings and push for it there as well. Never give up and always steer them to the website so they can see the value of having it in your school.